WASHINGTON, D.C. – Senator Mazie K. Hirono (D-Hawaii) continued to oppose efforts to exclude Native Hawaiians from the reauthorization of the Native American Housing Assistance and Self-Determination Act (NAHASDA), which provides affordable housing to the Native Hawaiian and other Native communities. 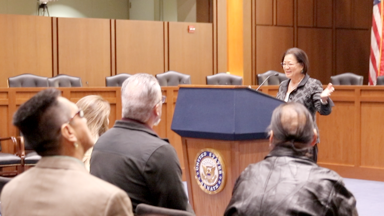 In remarks to the American Indian Housing Council, Senator Hirono pledged to continue to fight to pass a NAHASDA reauthorization that includes Native Hawaiians, and to fully fund other critical Native Hawaiian programs. Last September,Senator Hirono joined all Democratic members of the Senate Indian Affairs Committee to introduce S. 1895 to reauthorize the NAHASDA in a way that preserves funding for Native Hawaiian housing programs. Last June,Senator Hirono fought back against efforts to eliminate federal Native Hawaiian housing programs during testimony before the Senate Indian Affairs Committee.